Conservation studies began in the area, owned by Duke Power Company, in the late 1970s. And in 1982, nearly 275 acres of land that are currently in the park were placed on the North Carolina Registry of Natural Heritage Areas because of the presence of numerous rare species. In the late 1990s, Duke Energy determined that it no longer needed large portions of the Gorges for future hydropower and offered the land for sale to natural resources agencies in North and South Carolina. The North Carolina General Assembly authorized the creation of a new state park and adjacent state game land in 1999, and 10,000 acres were purchased by the state and divided: 7,100 for Gorges State Park and 2,900 for the state game land. Gorges State Park Master Plan was developed with considerable public input and adopted in February, 2003. Despite the rugged topography that typifies this portion of North Carolina, the area encompassed by the park has a history of human use that covers several thousand years. Archaeological investigations have documented numerous sites and features throughout the park. These include pre-historic sites used by Indians, such as small hunting camps, as well as historic sites used by European settlers, such as homesteads and cemeteries. The earliest pre-historic sites are believed to be up to 8,000 years in age, and sites established by Europeans date to the early 1700s. Transylvania County has a long history of tourism. About 1860, at an area now known as Rockbrook, a hotel was built. It was burned during the Civil War. Around 1890, J. Frances Hayes, a wealthy Pennsylvania railroad man, came to Transylvania County for health reasons. He founded the Toxaway Company and began building resorts in the area: Fairfield Inn and Fairfield Lake (1896); the Sapphire Inn in Jackson County; the Franklin Hotel in Brevard; and the Toxaway Lake and Toxaway Inn. He also started what would later become the Western North Carolina Resort District. The railroads served to bring some of the nation’s wealthiest families to vacation in the area. The original Toxaway Inn, built in 1901 and the 540 acre Lake Toxaway, completed in 1903, became a popular resort for America’s wealthy and famous. Before the railroad was extended to Rosman and Lake Toxaway, the Toxaway Company built a “turnpike” road from Brevard to Lake Toxaway. Advertised as “The Switzerland of America”, the Lake Toxaway Inn flourished as a resort from 1903 until flooding burst the dam in 1916. Henry Ford, Thomas Edison, Harvey Firestone, Edward Baccus, John D. Rockefeller, R.J. Reynolds, the Vanderbilts, the Dukes, and the Wannamakers all visited. Guests could boat, swim, play tennis, golf, fish, hunt, and horseback ride. Cultural events were also offered. About 1900, industrialist Joseph S. Silversteen came to Transylvania County and established operations at Rosman. Rosman, incorporated in 1901 as Toxaway (Cherokee for “redbird”), had its name changed to Estatoe in 1903 and then to Rosman in 1905. Silverstein's influence in the area is evidenced by the renaming of Estatoe to Roseman: Silversteen compounded the name of two of his associates, Rosenthal and Ormansky (Powell, 1968). He founded the Gloucester Lumber Company and a number of tanneries. Gloucester Lumber Company logged the watershed of the French Broad River’s headwaters, south of Vanderbilt’s land. In 1910, Silversteen acquired approximately 30,000 acres of land from George VanderbiltVanderbilt, George Washington, whose inherited fortune had shrunk due to bad investing. Logging practices of the early 1900’s often scarred the land, silted the creeks, and destroyed acres of wildlife habitat. Over the years, forests slowly reclaimed many farms and most of the cut-over land. In 1914, the U.S. Forest Service bought 78,410 acres of forest from the Vanderbilt estate. This land later became part of the Pisgah National Forest, established in 1916. It was the first national forest in the country created from purchased land. One of the most damaging interferences to the Gorges environment occurred in 1916 when the dam containing Lake Toxaway – the largest private lake in the state – broke. In July of 1916, much of western North Carolina had experienced extensive flooding, and by August, swollen watercourses were pouring into Lake Toxaway, straining the 60-foot high earthern dam. On August 14th the dam burst, not unexpectedly, and over five billion gallons of water are estimated to have rushed downstream, destroying communities in its path, uprooting trees, scouring the gorges and leaving piles of debris 15 to 20 feet high. Remarkably, no one was killed. These debris piles still remain. As a result of the 1916 flood, the once flourishing Toxaway Inn went out of business. Not long thereafter, the country moved into the Great Depression, and the area’s tourism languished. Public works programs arising from the Great Depression did construct outdoor recreation facilities and work on conservation projects, but it would be many years before tourism recovered. The Blue Ridge Parkway, one of those projects, opened its first sections in 1939. Rural electric associations brought electricity to western North Carolina, and the area slowly recovered. The Lake Toxaway area was purchased and the lake restored in 1961, and Lake Toxaway once again became popular as a resort and mountain vacation destination. The Singer Sewing Machine Company assembled large tracts of land in the Gorges State Park area and logged much of it. Then, in the 1940s and 1950s, Singer sold the land to Duke Energy Corporation. The corporation purchased the land for its steep topography and high rainfall, which offered opportunities for development of hydropower projects. Crescent Land and Timber Corporation, a subsidiary of Duke Energy, managed the land, closing some roads and limiting human access to protect the environment. Gorges State Park is located along the Blue Ridge Escarpment, an area where five streams carry water to the ocean from the divide between the Tennessee Valley drainage and the Atlantic drainage. Mountain streams gradually descend from the upper reaches of the escarpment, but near the state line the water plunges over waterfalls and rushes through steep-walled gorges. A significant geologic feature, from which the park derives its name, is the abundance of deep gorges created in part by a dramatic change in elevation of over 2,000 feet in a little over three miles. This abrupt transition, combined with the high levels of annual rainfall and a large drainage area, produces an abundance of waterfalls that visitors seek and enjoy. Gorges State Park is unique within the state parks system in that it straddles two major geologic provinces and the Brevard Fault Zone, which separates the two. The Brevard Fault Zone, one of the major ancient fault zones of the Appalachians, contains unusual rock types such as mylonite and marble. Mass slope movement features, such as the large slide on the east side of the Toxaway River, are evident. In addition, many boulder and cobble deposits have been identified along an 8,000-foot reach of the Toxaway River, attributed to flooding that followed an earthen dam failure at Lake Toxaway during August of 1916. The exceptional terrain and climate within Gorges State Park has made possible a rich and unusual assemblage of flora and fauna. The large and unbroken natural landscape includes high quality examples of extensive natural communities such as Montane Oak-Hickory Forest, Chestnut Oak Forest, and Acidic Cove Forest, and widespread Pine-Oak/Health Forest. Rich Cove Forest and Spray. Cliff Forest, uncommon natural communities, occur in small patches within the park. The area contains a concentration of rare plants, such as Southern Oconee Bells (Shortia galacifolia var galacifolia), significant for the state and the entire southern Appalachians. A particularly rich assortment of bryophytes and ferns, including a species more common to the tropical forests of Central America, is presumably owed to the high moisture and sheltered temperatures of the gorges. The animal diversities of natural communities in the park are also high, and rare mammals, birds, reptiles, amphibians, fish, and invertebrates are present. With such a rugged and contrasting topography contained within a small area, the park includes 21 of the 44 natural community types known in the mountain regions of North Carolina. Nearly 125 rare plant and animal species that occur in the mountain counties of North Carolina are found in the park, in addition to 12 endangered or threatened plant and animal species. From the rock outcrops of the peaks, to the high-elevation forests, to the spray cliffs surrounding the waterfalls, to the streams themselves, this ecologically rich region has been identified as being of national ecological significance by the state's Natural Heritage Program. Several plant species more typical of the tropics thrive where the constant spray from the park's numerous waterfalls and plunging whitewater streams shower the sheer rock walls and talus slopes with mist. Scientists are unsure how these species came to grow so far from the tropics. One theory is that spores blew north from the tropics and settled in the region. Or perhaps the species remained in the region from tens of thousands of years ago when a warmer climate existed in North America. While few larger plants can establish a hold on the steep, slick rocks surrounding the spray cliffs of the gorges, a rich community of ferns, mosses and liverworts grows in the moist, moderate temperatures of the region. Rare species found clinging to the spray cliffs include Carolina star-moss, characterized by its dark green rosettes. The moss is known in the Dominican Republic and also survives in the southern Appalachians. Pringle's aquatic moss, another rare species, attaches itself to rocks under running water. Pringle's moss is found in Mexico, but in the United States it is solely found in the southern Appalachian escarpment region. Gorge filmy-fern, Appalachian filmy-fern and dwarf filmy-fern, plants with leaves that are only a single cell thick, are also found in the Gorges. The ferns require constant humidity, which is provided by the continuous spray from the waterfalls. The gorge filmy-fern grows only in the southern Appalachian gorge region. The gorge bottoms are constantly wet with spray, but the steep slopes leading to the rocky, mountain ridges rapidly drain moisture from the terrain. The land supports oak and pine communities typical of dry mountainous regions, but the high rainfall also supports several rare species. Abundant species include rhododendron and mountain laurel, along with white pine, hickories and red oak. Oconee bells - also known as shortia - are rare flowering plants that also occupy some of the same territory. The plant is most abundant in the gorges region of North Carolina, and because so few populations of the plant are known, Oconee bells are considered to be an endangered species. The plant has single-stalked, white flowers, which stand above the evergreen leaves that form low patches along Escarpment streams. While the popular animal species of the region include black bear, wild turkey, fox, coyote, wild boar and deer, as well as a variety of squirrels, North Carolina's largest known population of green salamander occurs in the gorges. This secretive salamander hides in the damp, shaded crevices of cliff faces. The forests of the gorges also provide abundant habitat for neotropical migratory birds, including the largest North Carolina mountain populations of Swainson's warbler. Three fish species - turquoise darter, redeye bass and rosyface chub - have their only North Carolina populations in the park's rivers that are part of the Savannah River drainage. In addition, the nearby Horsepasture River is both a designated federal Wild and Scenic River and state Natural and Scenic River. North Carolina Division of Parks and Recreation. Gorges State Park. http://www.ncparks.gov/gorges-state-park (accessed September 1, 2015). North Carolina Division of Parks and Recreation. Gorges State Park General Management Plan. 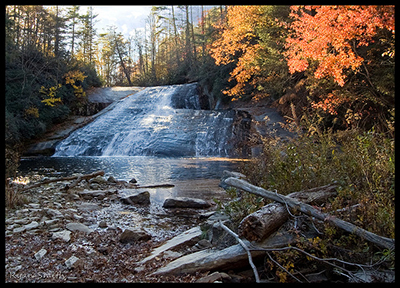 January 2005. http://www.ncparks.gov/sites/default/files/ncparks/37/gmp-gorg.pdf (accessed January 11, 2016). Becker, Sharon. Gorges State park visitor center dedication. Photograph. October 12, 2012. North Carolina State Parks Collection, North Carolina Digital Collections. http://digital.ncdcr.gov/cdm/ref/collection/p16062coll27/id/215 (accessed November 6, 2015). Blackburn, George. The Astronomer’s Journal. McLean, Virginia: Carolina-Virginia Genealogy Publishing Company, 1995. DePratter, C., C. Hudson, and M. Smith, 1985. Juan Pardo’s Exploration in the Interior Southwest, 1566-1568. The Florida Historical Quarterly 62:125-128. Hudson, C.; M. Smith; and C. DePratter, 1984. The Hernando DeSoto Expedition From Apalachee to Chiaha. Southeastern Archaeology, 3: 65-77. Powell, William. S. The North Carolina Gazetteer. The University of North Carolina Press, 1968. 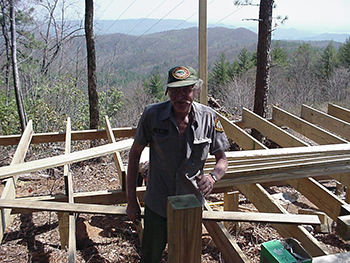 USDA Forest Service, October 2001. Forest Heritage National Scenic Byway. Recreation Guide R8RG 309. Pisgah Ranger District, Pisgah Forest, North Carolina. Smith, Ryan G. [Hidden Waterfall, Gorges State Park]. Photograph. August 7, 2008. Flickr. Used under Creative Commons License CC BY-NC-ND 2.0, image size reduced. https://www.flickr.com/photos/rsmith4321/2089190667/ (accessed November 6, 2015. North Carolina Department of Parks and Recreation. [Timber Rattlesnake, Gorges State Park.] Photograph. May 12, 2013. 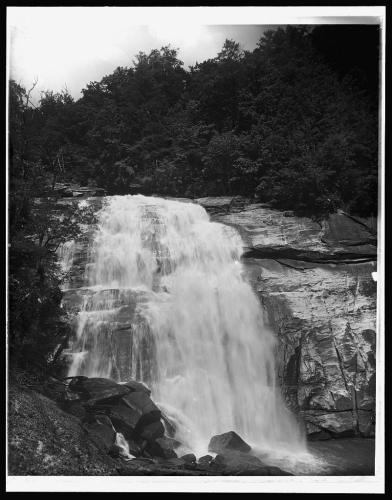 North Carolina State Parks Collection, North Carolina Digital Collections. http://digital.ncdcr.gov/cdm/ref/collection/p16062coll27/id/133 (accessed November 6, 2015). [Sapphire, N.C., Horse Pasture Falls]. Photograph. ca. 1890-1906. From the Detroit Publishing Company Collection, Library of Congress. http://www.loc.gov/pictures/item/det1994002208/PP/ (accessed January 16, 2016).